In health care, assisted living, and attendance COBS provides safe and secure communication solutions for both staff and elderly people. Time is critical, our products and applications ensures fast and efficient information to the right persons at the right time. To ensure the right attention and response, we have developed a unique user interface with icons and color codes. Our phones can be used in combination with a nusre call system or elderly care solution with silent alarms. 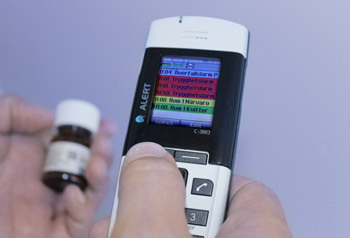 Each alarm is sent directly to the right person, and if not answered it escalates to another group or to another phone. This way you can avoid beeping and flashing ceiling displays and the patient integrity is protected. To ensure that your staff is safe and secure, our handset is equipped with an alarm button on the top. Thanks to smart positioning features you can keep track of where your patients and staff are located. Our technology is built on active RFID, which has been proven for more then 10 years and is state of the art still.